Bring seasonal color indoors with this lavish array of fall flowers! Our dynamic Autumn Adventure arrangement is sure to make any occasion beautiful and memorable. 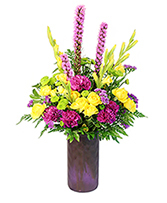 Order flowers online 24/7 or call DONNA'S FLORIST & GIFTS to place your order. DONNA'S FLORIST & GIFTS creates a tantalizing, seasonal potpourri of warm fall colors with their vibrant, fall flower designs. Select an arrangement with glowing fall colors to illuminate your Bristol, CT home. Show a little affection with a floral bouquet of autumn flowers. If you're more daring, be a little flirtatious with a fall vase arrangement filled with copper, saffron and pomegranate colored flowers. The expressions of fall can be found everywhere in Bristol CT. Whether you want a homespun delight or a festive centerpiece, fall magic is always available at DONNA'S FLORIST & GIFTS.